The Dario All-in-One Smart Meter is specially designed to fit your lifestyle. This sleek, all-in-one glucose monitoring solution includes a simple-to-use glucose meter, disposable test strip cartridge and lancing device – that comfortably fits in your pocket. Connecting to your smartphone, the smart meter makes it easy to manage your blood glucose level and automatically log results. The simple-to-use personalized smart meter automatically logs & tracks blood glucose levels, provides actionable insights and alerts. It plugs conveniently into your smartphone so you can view and share results with your healthcare or family member wherever you are. The glucose monitoring device uses an ultra-thin lancet for convenient, pain-free blood sampling. The lancet is designed for safety and only requires a tiny blood sample for an accurate reading. The Dario smart meter works seamlessly with supported Android or iPhone mobile devices. The glucose meter easily plugs into your mobile device’s headphone socket. 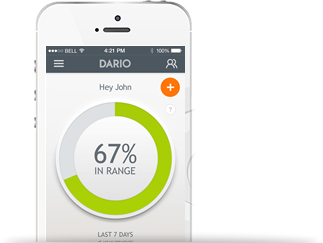 The Dario app automatically syncs with the Dario meter each time it is connected to your mobile device, and stores the information in the cloud for further use and referencing. Dario is a state-of-the-art diabetes data management or blood glucose level management that connects the user, health care professional or loved one anywhere in the world. Dario‘s cloud-based software provides you with an easy seamless way to record, save, track, analyze, manage & share all your diabetes related information in one lifestyle management platform. Through the Dario web portal you can access all your activity and medication data and track your progress. Your data is always in sync and always accessible on-line in a user-friendly interface via a secure Web session.